Last night I played my first proper session of Pathfinder. I played and ran D&D 3rd Edition/3.5 for nine years and had also played the first scenario in the Pathfinder Beginner Box but this was my first full-on Pathfinder game. So, how hard was it going back to a variant of the edition I’d stopped playing in 2009? The answer is not very. We were playing the Rise of the Runelords adventure path, set in Paizo’s colourful Golarion setting, and our GM and group were great fun to play with. Rob’s gnomish bard Scaramouche Fandango made me laugh – a lot – and there were a lot of funny moments. Having a good group is the most important thing, not the rules system, and having a strong adventure helps too. I’ve also been playtesting a fair bit of D&D Next recently and the two systems are not that different in feel. My Pathfinder character is a spell-less ranger (not that standard Pathfinder rangers have spells at 1st level) facing my favoured enemy, goblins, so had a lot of fun taking quite a few of them out with my longsword and longbow. I didn’t really miss having cool martial powers but I think, like the D&D Next feedback is showing, there is a middle ground between giving everyone “spells” and giving the fighter types nothing interesting to do in combat. A small number of per encounter or per day special attacks for non-spellcasters would be my preference. Combat was fast and we fought through three groups of goblins in a series of linked encounters. Combat speed is one of my biggest issues with 4e and playing with counters and a grid (actually a nice colourful battlemat) didn’t slow us down. Then again, we are only 1st level so it’s hard for the more dithery players in our group to spend ages thinking what to do on their turns with a very limited selection of options to pick from. A couple of things annoyed me. The main one was critical threats. This rule needs to go. A natural 20 should be a critical – it’s very frustrating to roll one, not confirm the critical and then do crappy damage! Hopefully the GM will house rule it out. In addition, none of us could remember the different bonuses for attacking a prone opponent , flanking and so on. 4e streamlined these to +2 and Next has the Advantage/Disadvantage mechanic, both of which are more elegant and easier to remember. I haven’t yet got my head round CMB and CMD but it these two stats mean that the hideous 3.x grappling rules are gone, then huzzah! Overall, it was a very fun session with lots of good roleplaying and fast-moving battles so I am eagerly awaiting the next episode! 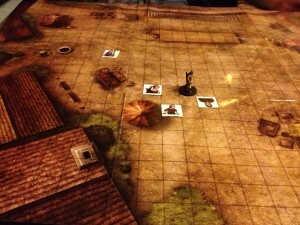 The continuity of monsters in Rise of the Runelords means that if you pick the right monsters, monsters you are encountering, as your favored enemies, you'll be sitting pretty. I was going to suggest one, suggest a very fulfilling path-- I wrote about it at Tor.com actually-- but I will keep mum in case you are a purist when it comes to spoilers. Yes please keep quiet- I don't want z45tu7 ramping up the challenges if he thinks I am party to privileged information. Oh well there you go; that was in fact exactly the tip I was trying not to say. Be a giantkiller! Reading the campaign, I was like "oh man, I totally want that." I'm not saying anything further, you almost tricked me into giving another "hint"! Hahaha! I'm not doing it deliberately! Anyway, I think it does make sense for a PC ranger to focus his enmity on monsters that will actually appear in the campaign. It is just really interesting how nicely giants scale; you can start in on them surprisingly early, & keep on fighting them for a long time. I know that the classic D&D adventures used them a lot, but I haven't really seen anyone go big with them in the modern incarnations of the game, besides Rune Lords.